When this photo was originally posted no other information was known about this woman other than her name. Because of the comments left by our readers we now know much more about her. Use the comment link below to learn more about her. If you have other information about her, please leave a comment to add it to this page. Thanks! Mary V McDavid (Dec 1872-1924) md. Lewis Patton Williams on 3 Jan 1889 in Scott Co,VA. She was d/o William Miller McDavid and Malinda Lane. They had 11 children:Elbert Ingle md. Darthula Adams; Melvinia; William Dewey md. Rebecca D Adams; Myrtle; Stella M; Roy Columbus md. Elda Victoria Bates; Charles B md. Pollie Williams; Ova Edith md. a McClellan;James W; Hubert E and George. How unusual to stumble across a picture of my grandmother on the web.I also have a picture of my grandfather (Lewis Patton williams) if anyone is interested. All of their siblings are now deceased but there is a large number of us grandchildren,some with grandchildren of our own. would love to see pic of lewis patton Williams. I would like to hear how you come into the family. I have been searching for a couple years on the Williams. there is a pic of lewis patton in the Williams album page in scott county va historical society but i was not for sure if this one was mary v’s husband. my grandfathers down to my father is. Abraham,elisha breeding,william henry,paul, Rebecca. hope to here from you. Mary V. McDavid was born Dec. 1872 to William Miller McDavid and Ferlinda Malinda Lane who m March 16, 1867 Hawkins Co. TN. Mary married Lewis P. Williams Jan 16, 1889 at the residence of W. M. McDavid in Scott Co. VA. She was age 17 and he was age 32. Lewis P. Williams was the son of Abraham Williams and Mahala Lark. Mary McDavid Williams died 1924 and Louis Patton Williams died 1918 and they were buried in the McDavid Cemetery,S. Clinchport, VA.
Mary Virginia McDavid b:Dec. 1, 1871, Scott County, Virginia,d:1921, Scott County, VA. Daughter of William Miller McDavid and Ferlinda M. Lane. Married Lewis Patton Williams Jan. 4, 1889, Scott Co. VA. Children from this marriage were:1)Elbert D. Ingle Williams,2)Margaret Melvina Williams, 3)William W. Williams, 4)Myrtle Eliza Williams,5)Stella M. Williams, 6)Roy Columbus Williams, 7)James W. Williams, 8. )Charles B. Williams, 9)Hubert Kelly Williams, 10)Ova Edith Williams. One Brother James Taft McDavid, One Sister Nancy Margaret McDavid. Also have descendancy information on children and Brother and Sister if anyone would like to have it. would like descendancy info on james taft mcdavid and sister nancy margaret mcdavid. Hello, my name is Sandy McDavid, I’m looking up info for more McDavids and James Taft was one of their grt grandfather’s, do u know Black Jim’s fathers and mothers name and back as far as u can on Jim. My grt grt grandfather was William Wheeler McDavid, I’m trying to c how and if we are connected to James Taft. Michael and Matthew Mathias was my third and fourth grt grandfather. Mary Virginia McDavid Williams was born Dec. 1, 1871, Scott Co., Virginia. 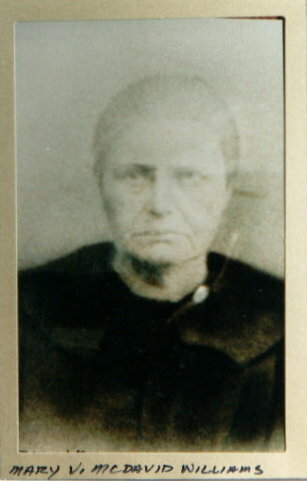 She married Lewis Patton Williams, son of Abraham Williams and Mahala Rachel Lark, Jan. 4, 1889, Scott Co., Virginia. Lewis and Mary had 10 children. Mary passed away 1921, Scott County, Virginia,her burial location is in the McDavid Cemetery with her husband Lewis. I would like for K Thompson to share with me the info she has about my grandmother,Mary Virginia McDavid Williams and her family,The e-mail address she has given does not work.